Since we have a direct relationship with the end users of our products, we make it our duty to always use the best materials. Unlike other manufacturers who sell their products to global companies and, consequently, are merely interested to offer average-quality products at lower costs without taking responsibility for the raw materials they use, we will answer for the quality of our materials at any time. A clear example of this is illustrated in the chart alongside showing the various types of carbon fibres. 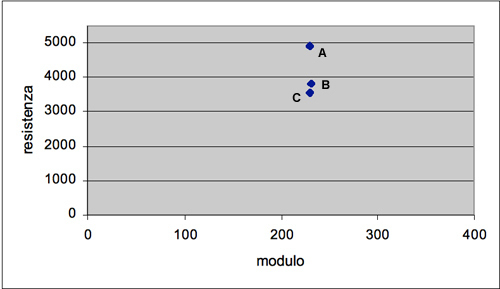 As can be seen, all types of HR fibres shown here have a similar modulus of elasticity, but different tensile strength values. This means that a tube made with an A-class carbon fiber (our choice) will have the same weight and stiffness of a tube made with the C-class one (less expensive). But, while the two products appear to be virtually identical, when subjected to a high tensile load, the C fibers will break long before the A ones. Still talking about raw materials, Italcanna who has always been interested and opened to new technology innovations, has recently introduced in some of the tubes' series nanocomposite charges into the matrix, with the result of a significant increase in tensile streght and flexural elastic Modulus.